The intent for our curriculum is to provide the highest possible standard of education in an environment that both motivates and empowers children to become independent learners and good and caring citizens. We are committed to developing the whole child and ensuring our children are best prepared for the 21st Century, equipped with the appropriate skills and attitudes to enable them to succeed now and in the future. Our unique Christian ethos supports developing a child’s spirituality, curiosity, and awe and wonder about the world in which they exist. We teach the Early Years Foundation Stage curriculum in our Reception class, and National Curriculum in Year 1 to 6. Both curriculums are implemented through the school’s own Creative Curriculum, designed using pupil, parent, staff and governor ideas. 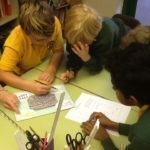 The curriculum is covered through a range of different themes (topics) in each year group and we aim to make relevant and meaningful links between subjects. Potent, rich texts are at the centre of each topic and we aim to ensure learning is linked to real life and real experiences. Pupils develop their knowledge by visiting places, listening to visitors and taking part in challenges that develop their independent learning skills. Where meaningful links cannot be made, we teach these aspects of subjects discretely to ensure we have full coverage and adequate progression for each curriculum area. Our curriculum will promote successful relationships, encourage lifelong learning and fuel children’s confidence, aspirations and ambitions as well as ensuring each child reaches the highest standards in literacy and numeracy. Our curriculum will fully equipped our children for each phase of their life and ensure they have the life skills they need to find their place in the world in which they live – locally, nationally and globally. Each curriculum subject has its own page, where we give a fuller overview of our vision for each subject and how it is taught across the school. You will also find each terms topic overviews for each base below.